Broadchurch is a British Television crime drama, the first series originally aired in 2013. It is an eight episode series which is absolutely fantastic in a number of ways. I write this post with great caution to be spoiler-free because the intrigue of Broadchurch is that it's a fantastic "who-done-it." And from the end of Episode 1 my wife and I started to play this guessing game. A game which I truly believe creator Chris Chibnall hoped we would play. For example, in Episode 1 my wife selected a character we hadn't even formally met yet, but appeared briefly in a montage of reflective/impacted characters. We met her chosen criminal in episode 2, and as suspected he was a suspect. At it's one of those things, were everyone is suspect. Yet, this is not just a police procedural or mystery, genres I often have a hard time getting excited about. Because Broadchuch while dedicated to solving the crime is also about telling a story. 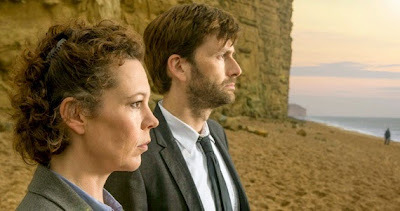 The film's primary characters are Detectives Alec Hardy (played fantastically tepid by David Tennant), and Ellie Miller (also fantastic, played by Olivia Coleman, in her BAFTA winning role). The interesting thing to me about British TV sometimes it seems to cast differently - these actors were both so fantastic in their roles but in a leading role neither of them seem like a Hollywood star, instead they play their roles so convincingly, in ways that very human. Both the endearing and unflattering side of human. The filming is beautiful and not just for it's Jurassic Coast setting. It has this exceptional pacing that creates a sense of timing and rhythm. The filming and editing are done in such a way that it tells you when to pause, to think, to reevaluate your thoughts, and to consider the character's positions and feelings. The filming is very much an active part of the story telling, and it works effectively from episode 1 to episode 8. There are also some other incredibly excellent performances, but to mention names and actors almost in it's own ways opens up the door to spoilers. But there really was not a single actor in the film whom I did not find perfectly cast performing at an exceptional level. The overarching plot itself may not be the most unique (a murder investigation in a small town), but it doesn't really matter if there's a creative plot devise on the front end, because it's gripping, beautiful and compelling in each step of it's execution. This past year, the show was retooled by Fox TV for American consumption as the show Gracepoint were David Tennant reprises his role. Although, while intrigued can't imagine that version being better than this, and the plot of the two versions is the generally the same in the American reiteration. The second series is currently airing in United Kingdom, and honestly, this is one of those shows where I can't imagine how they recapture the magic of the first series, but am eager to catch Season 2 when it is available. It has also been renewed for a third season as well. Broadchurch is great serial television, and I can't say enough how compelling, beautiful, and well acted this show trully is -- a genuine pleasure to watch, up to the last minute. I'm with you. I watched only the British version and was totally engaged first to last episode.